STALKER (STÄLKER) - Powermad 7"
Napalm Records, black vinyl, ltd 300, 2 EXCLUSIVE Non-Album Tracks. Speed metal demons Stalker staked their infernal claim with their 2017 Shadow of the Sword debut, which included pedal-to-the-metal mayhem and maximum intensity throughout. In preparation for their next full-length attack, expected later this year, the New Zealand power-trio are unleashing a limited-edition 7? 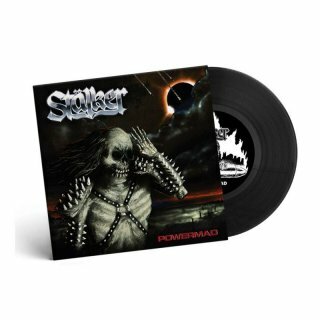 featuring two new iron-clad anthems, ?Powermad? and ?Behold the Beast?. Bristling with primaeval thrash and stampeding bass, Stalker?s latest tracks exhibit all the charisma, abandon and shred-head pyrotechnics that secured the band?s scorching live reputation. Stalker pay due respect to their '80s forebears, but the trio aren?t living in the past. Pushing themselves ever harder, Stalker?s latest spandex-and-leather-clad songs are as raw and bloody as a fresh kill. ?Like the blinding flash before the shockwave hits, we?ve unleashed this 7" killing machine to foreshadow our new full-length,? notes Daif King, the band?s vocalist and bassist. ?Prepare yourself and get up to ramming speed or risk it all when the blast wave hits. Forwarned is forearmed, you surface dwellers!? Stalker hit red-lining speeds on the scorched-earth battlezone ?Powermad?, while black magic boils over on the similarly possessed ?Behold the Beast?. Raw-yet-honed production ensures all the sonic filth stains your soul, while Stalker?s razor-sharp riffs cut deeper than ever.